Ally Scraps: Looking for just that perfect embellishment? Who doesn't love finding that just perfect ready-to-stick-on-the-page embellishment? I know I do! But sometimes, what you have in your stash just isn't quite what you're looking for. So why not turn to those neglected stamps (come on, I know you have them!) and create something one-of-a-kind that suits your needs perfectly! 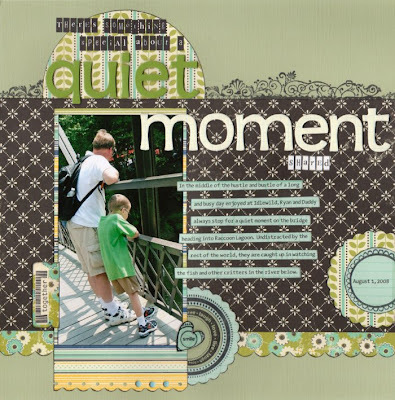 For my page "a quiet moment shared", I used several different stamp sets to add interest to my page, and give it just the extra personal touch that I was looking for and couldn't quite find in my usual stash of embellishments. The page features the gorgeous papers and die-cuts of the October Afternoon "Hometown" line. I really liked the little index tab die-cut, and thought it would be perfect with a stamp from the Autumn Leaves Stamped and Coded collection. To give the stamping a crisper and neater look, I used Post-it notes to mask off the printed edges of the die-cut, so that only the white was left visible. The scalloped circle at the lower corner of the photo includes several stamps and multiple layers. First I punched the large scalloped circle from the blue ledger paper, and stamped it with one of the circle borders from the Kelly Panacci 360 Degrees stamp set. Next, I cut a circle from a scrap of my background cardstock, and stamped it with the "live laugh love" stamp from the same KP set. 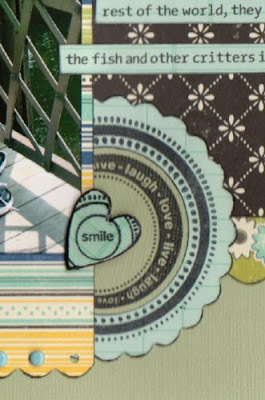 After adhering these to my page underneath the photo, I added a chipboard heart, covered with the blue ledger paper, and stamped with the "smile" stamp and another circle border from the KP set. Just a bit of the border shows since most of it was off the heart, but that's ok - it's enough to give the sense of another circle border, and the common theme helps to tie the entire stamped embellishment cluster together. 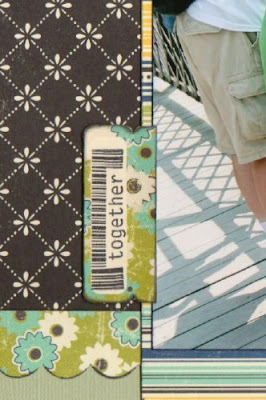 Finally, I wanted to add another layered scalloped circle, with the date, along the page edge. 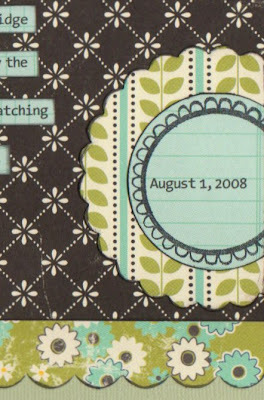 Although the date itself was computer-printed on the paper to match the journaling, I dressed it up with a stamped circle - yet again, another one from the KP 360 Degrees set! This helps to tie together the circle theme throughout the page. Combining your stamps with text or graphics generated from your computer can be a very effective way to create custom embellishments! And since I was in such a stamp-happy mood, I also added a border with these Kelly Panacci border stamps. They are so pretty, I really love the touch that they added to the page, and how the balance the October Afternoon die-cut border strip at the bottom. So, are you itching to get out your stamps yet? I hope so! I would love to see what you can come up with when you start stamping away! Wonderful way to use the stamps Debbie! This is a gorgeous page and the stamping really is the perfect finishing touch! fantastic job with the stamps deb!